KAL’s Manufacturing Facility at Athani, Kerala, produces a range of 350 Classical & Proprietary Ayurvedic medicines, including therapeutic formulations. Our Resort, Hospitals, Wellness Centers and Clinics offer a full range of Ayurveda Lifestyle Products, including health supplements, skin and beauty care products and specialty foods. These medicines are manufactured based on the formulas developed by Kerala Ayurveda Limited’s R&D division. Our products are very efficacious and have won the trust of clinicians and consumers as they are clinically tested and proven effective by Clinical trial, Animal trial etc before being launched in the market. These are formulations manufactured based on the Ayurvedic Formulatory of India (AFI). These products are developed from 3000-year-old scriptures. In KAL, we follow the traditional method for manufacturing these products. These are once again Proprietary formulations of Kerala Ayurveda Limited and are aimed at the needs of our Consumers. Our Consumer medicines range from Beauty and Personal Care products to Health and Wellness supplements. KAL Ayurvedic Wellness Centers : are unique Ayurvedic treatment centers with excellent facilities for rendering all kinds of Ayurvedic treatments. Eminent Doctors as well as trained Paramedical Staff provide maximum care to our patients.Treatment is available for various ailments like Joint Pain, Low back ache, Auto immune disorders, Ulcer, Sinusitis, Skin diseases and other general ailments. 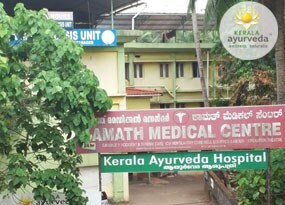 In addition to this, KAL Clinics offer Kerala specialty treatments like Panchakarma (Bio detoxification Therapies), Curative and Rejuvenative as well as palliative Treatments. KAL Hospitals are full-fledged main referral Hospitals with adequate health facilities, providing all types of Ayurveda treatments under the supervision of expert Doctors. Our Hospitals attract patients from within the country and abroad for availing treatments for various ailments and health concerns. Our Hospitals are equipped with a good library, recreation hall, and facilities for yoga and meditation. 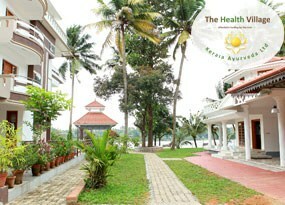 A unique Ayurveda Hospital at the banks of River Periyar, with excellent infrastructure with modern amenities in a rich natural serenity. 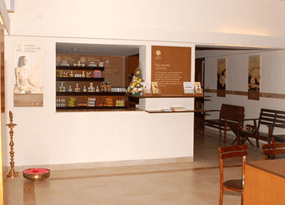 With an In-patient setup to accommodate twenty patients at a time and render all kinds of Ayurvedic treatments. Eminent Doctors as well as trained Paramedical Staff provide the best care to our patients. Set in the quiet ambience of Nature, AyurvedaGram has created a traditional Kerala ethnic and healing ambience by transplanting 165-year old Heritage Houses and Palaces. 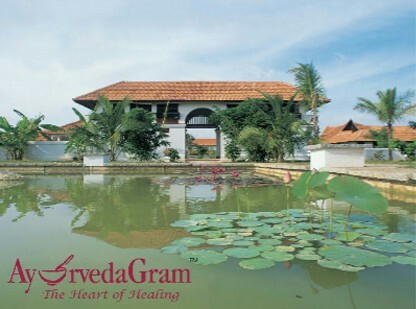 AyurvedaGram is managed by Kerala Ayurveda Ltd (KAL). The Resort is an Ayurvedic Village with Resident Ayurvedic Physicians, Therapists, a Health Center, Dispensary, Yoga and Meditation Center, Residential Heritage Cottages and Vegetarian Restaurant… all under the personalized attention of impeccably trained staff. At AyurvedaGram, the ambience of greenery is complimented with architectural splendors of the era bygone. The traditional homes of Kerala – Nalukettu, Kovilakam, Manaas and Illams, have been recreated to give the prefect ambience of serenity. The Yoga Arc, a part of AyurvedaGram, seeks to impart the knowledge of Yoga for the purpose of general well-being and as a therapeutic science to provide relief and cure from specific ailments. It aims to help people along the Path of the Yogi, through the brand of Yoga followed by us: Shanti Yoga. This exposes the Practitioner to all 4 branches of Yoga through a style which encourages stillness in action. ShantiYoga is a gentle Yoga focusing on Philosophy, Asanas, Pranayama and techniquesof Meditation and Mantra chanting. 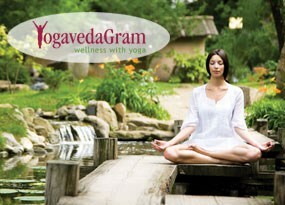 For more information, visit www.ayurvedagram.com. Kerala Ayurveda Academy is the first-of-its-kind in the US to provide authentic Ayurvedic programs throughout the country. We currently offer classroom programs in the states of California and Washington.Kerala Ayurveda Academy, USA, offers the Ayurvedic Wellness Counselor (AWC) Certification and Ayurvedic Wellness Practitioner (AWP) Certification.For more information, visit www.ayurvedaacademy.com.